What the world needs now is Canada — and some love, sweet love. Last night I got the best history lesson I’ve had in years when I watched former PM, Joe Clark, Barbara McDougall, Bill Graham, Lloyd Axworthy and Chrystia Freeland get up and talk about Canada’s impressive record of speaking truth to power. From left to right: Chrystia Freeland at the lecturn, Lloyd Axworthy, Barbara McDougall, Bill Graham and Joe Clark. 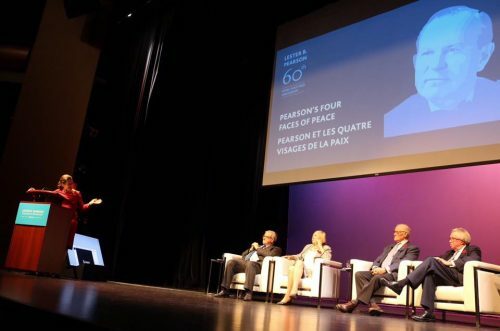 The panel gathered at the Isabel Bader Theatre at the University of Toronto to mark the 60th anniversary of Lester B. “Mike” Pearson’s Nobel Peace Prize for resolving the 1956 Suez Crisis. At the time, the Nobel selection committee credited Pearson with “saving the world” through his work with the United Nations. Everyone on last night’s panel agreed that there was no better time to think out loud about the significant role Canada must continue to play in resolving and reshaping the current global disorder. What became clear pretty fast is that the “big swinging dicks” vying for power right now are the kind who delight in pumping toxins into democracies. None of the distinguished panel used the term “BSDs” (thank you Michael Lewis), but all of them, as former and current Ministers of Foreign Affairs, were very blunt about what is at stake, and how Canada must step up and assume our historic role as Chief Architect of multilateralism. 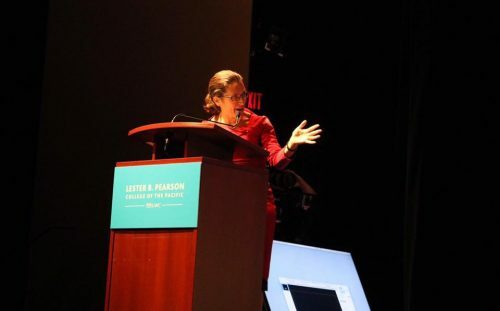 Multilateralism — or collaboration around a common good — is the Canadian ideology that Pearson espoused as Canada’s Secretary of State for External Affairs, and, later, as Prime Minister. Empathy, bridge-building and peacekeeping were the great hallmarks of Pearsonian diplomacy and they became the agreed upon values the West adapted after World War II, said McDougall. Pearson understood that democracy depended on our ability to manage our different opinions. Axworthy brought up other seminal (albeit lost) moments in history when Canada spoke her mind. “We were the first country to declare ourselves a non-nuclear nation in 1945,” he said. “We had the fuel and the delivery systems, but what was the trigger for that? There were no nuclear protests in the streets.” It was decided in confines of cabinet, he discovered in his readings of history. The way we made our country come together through public policy shaped who we became. “We were also the first nation to tell the Americans that they or the Soviets would destroy the world,” said Axworthy, “and that they had to put their nuclear weapons under international control.” Mike Pearson looked Harry Truman and McGeorge Bundy in the eye when he delivered that message. On American soil, Pearson later spoke out against Lyndon Johnson’s participation in the Vietnam War. Axworthy, who got back last week from a six-week trip to the Balkan Peninsula, said that “the degree of animosity in Europe right now is a Brexit-style anguish. It’s everybody for themselves. The system is broken.” What was clear in his rounds of talks with the Balkans is that they believe that Canada will be the leader the world needs. But as former Defense Minister, Bill Graham pointed out, “there is no peacekeeping in the traditional sense anymore,” not in a digital age, a nuclear age and with the rise of drones. We need to address peace by removing the causes of war and by looking at the international organizations we belong to and strengthening then. But as Freeland recently tweeted in her dealings with the U.S. over NAFTA: “Capitulation is not a negotiating strategy.” She has arranged to have T-shirts emblazoned with that tweet made up for Trudeau’s cabinet. How about some loud socks too?